Will the solar eclipse be visible in the state of Massachusetts and if yes, at what time ? No, not in Massachusetts or any part of the U.S. According to the link given below, no. It's a picture of the path of totality of the eclipse. MA is not even close. You might see a partial eclipse but that's around 9:40 UT which is probably before dawn in the United States. Go to this website: http://eclipse.gsfc.nasa.gov/eclipse.html And you can see a listing of all the eclipses scheduled to happen. I think their table only goes to 2009 for now, but they update it regularly (I hope). July 22, 2009, your best bet would be Guam perhaps? I went to Mazatlan back in '91 to see a total solar eclipse, and it was so worth it. I would love to see one again - when I have the time and money to travel. 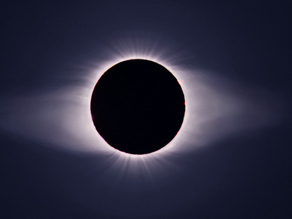 The last solar eclipse, March 29, 2006...caused an earthquake in Iran. Iran appeared to be about central in the streamline of the pathway. Beijing? It will be interesting to see where it falls. Will take a long time to loose the Moon. Perpetual power, inexhaustable, for a while. Can the sun move the earth? Constantly. All the bodies orbit around common centers of gravity. The Earth moves the sun, and vice versa. Describable, but not predictable inside of the natural boundaries of the laws of physics. Can be realigned by unpredictable outside events – wandering planets, asteroids, comets, etc. Basic non-linear dynamical systems theory (Chaos theory). 3 body problem. Which way will the ball roll? Probabilities do not exist, so why do we react to them? Sun rotates every 27 days. Earth causes tides in the Sun, friction coupled, just like the Moon is to Earth. Chaos, a mathematical elegance, is constrained by energy limitations. Dark matter, dark energy. to be assimilated. Statistics implies need for more exact models. But statistical mechanics gives insight. when is the next solar eclipse going to be if ur in massachusets?, will u see it?, and whats the date that you can see it and if its 2010 when? Franklin and Marshall in Italy in 1999 before Giuseppe Albarelli and Andrea Pensiero was established. It is a generous universal brand.